Divorced Catholics cannot receive communion, but Pope Francis has clouded the issue. Adrian Chiles is divorced and faces not being able to take communion if he remarries. The laws around divorced Catholics receiving communion are both clear and strict. But recently Pope Francis has clouded the issue with a number of pronouncements, giving millions of divorced Catholics hope that they will be able to receive the sacrament at mass. Catholics who divorce in civil law are still married according to the law of the church, and any relationship they enter into is adulterous. And as that's a mortal sin, they cannot take communion. Adrian Chiles hasn’t married again after he divorced, but hasn’t ruled it out. He knows, though, that once that happens, he won’t be able to receive the most important element of his faith, and that bothers him. Adrian begins by meeting Cristina Odone, a Catholic journalist who tells him how she cannot receive communion because she is married to a divorcee and how much this upsets her. He also meets two divorcees who face having to get an annulment of difficult marriages. There are many Catholics who want the law upheld, and many others who have been given hope by the Pope. Adrian uses his own situation to explore this thorny subject which is causing division in his church. 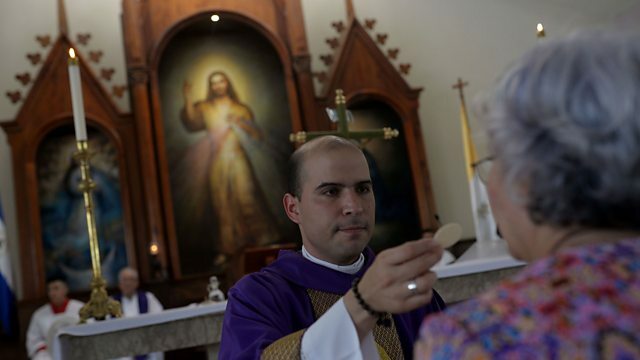 Photo: A priest handing out communion during mass Credit: Getty Images.